Google’s Gboard, the app that integrates Google Search and other features right into the smartphone keyboard, is being updated today with a handful of notable new additions, including the integration of key Google services, like YouTube and Google Maps. This will allow Gboard app users to share their location with friends, or any other address, directly from the keyboard, as well as search and share YouTube videos without having to separately launch the YouTube app. Gboard was first launched on iOS last year, as a means of more deeply integrating Google Search on mobile devices. The move came at a time when more of the activity taking place on mobile phones is occurring in standalone apps, like Facebook and mobile messengers, and not in the web browser – a change in user behavior that Google knows can impact its bottom line. In addition, mobile search is more costly for Google. Its parent company Alphabet continues to report higher traffic acquisition costs in its quarterly earnings – a result of the shift to mobile search over desktop. This is in part due to having to pay Apple a hefty portion of Google’s mobile ad revenue to be the default search engine in the Safari browser. One strategy to address this change in Google’s favor is Gboard – a mobile app that delivers the most utilitarian features of Google Search within the keyboard. The app, at launch, allowed users to search for things like flight times, news, restaurant and business listings, and more from the keyboard, then paste the information returned into chat. It has since been expanded with improvements like smarter phrase suggestions as you type, instant translation, GIF and emoji suggestions, and more. The larger idea here is to make accessing Google a part of the everyday experience of typing on your smartphone, without having to launch the phone’s web browser to do so. Today’s update brings two more of the most-accessed Google properties into the Gboard app, which could make it more a more appealing download for consumers. Now, alongside the option to search Google from the keyboard with a touch of a button, you can also search YouTube and Maps. The results display, card-style, in a carousel you can swipe through horizontally at the bottom of the screen. Then, with a tap, you can add any individual result into your chat, no matter which app you’re using for texting – whether Whatsapp, Messenger, iMessage, or any others. The first Maps result is your current location, followed by other nearby businesses. Or you can search Maps for an address and add that instead. YouTube’s integration, meanwhile, lets you search the video sharing network just as you would on YouTube’s site itself, then pop links to a video into your conversation. Another more minor, but fun, feature rolling out today is support for drawing. 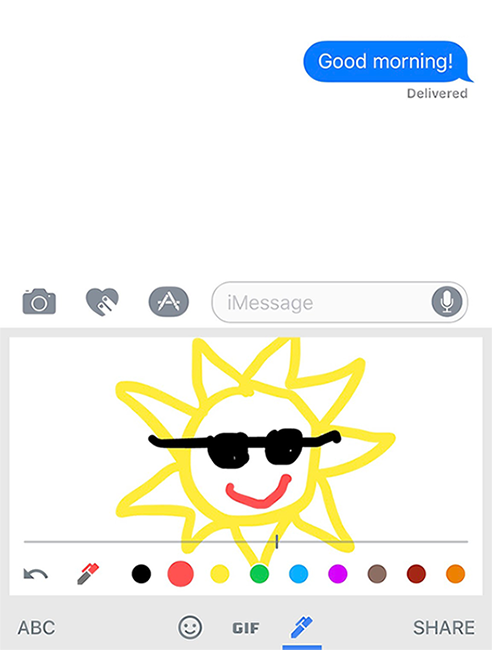 This new “Ink” option lets you tap on the emoji button to access a new pen in order to draw a picture you can then send via text. Gboard recently introduced a drawing feature on Android, which allowed you to draw an emoji which Gboard would recognize in order to return matching emojis you could use in chat. The new drawing feature, however, is focused on sharing doodles – much like the “Digital Touch” feature built into iOS also allows users to share images they craft themselves with friends via text. The new features in Gboard are rolling out first on iPhone, says Google. The updated app, which also now supports the Arabic, Hebrew and Farsi languages, is a free download from the Apple App Store.